Atomic scale materials "softer" or "harder"
Discloseing physical and chemical of atomic scale, there need to understand dynamic characteristics of atomic scale materials. 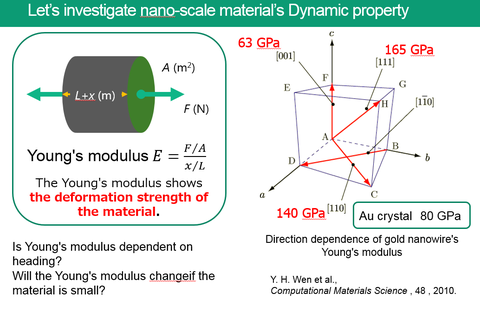 Theoretical calculations predict that the mechanical properties are different from bulk materials (in many cases polycrystalline) until now, but according to the potential used for the calculation, the result that the Young's modulus increases or decreases is obtained. Developing force measurement method of nanoscale, our laboratory discloses dynamic characteristics of atomic scale materials. Aiming smaller electorical devices, there are researches about nano devices like atomic switch. Along with those reseach, metal nano-contact's electrical characteristics and dynamic characteristics are receiving a lot of attention. Although it was pointed out that metal nano-contact's dynamic characteristics closely involved contact structure, being no such analyzer, it wasn't elucidated. So, investigating metal nano-contact's dynamic characteristics, we developed the TEM-AFM holder incorporating force measuring sensor (one of the techniques used in Atomic Force Microscopy (AFM)). By using this, we can measure dynamic characteristics while observing contact structure. 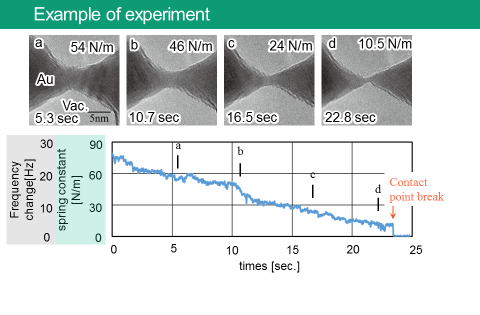 Looking at the example of the experiment, as it changes "a" to "d", gold nano-contact's get narrower while the spring constant become smaller. In this way, we can get mechanical characteristics according to nano-contact structure by using the TEM-AFM holder.